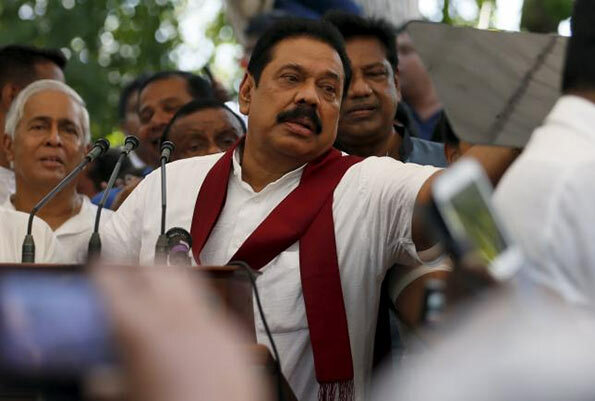 Sri Lanka’s war-time president, Mahinda Rajapaksa, has signed nomination papers to fight an Aug. 17 election as part of a coalition led by President Maithripala Sirisena, Rajapaksa’s spokesman said on Friday. Rajapaksa’s crushing of a 26-year Tamil Tiger insurgency in 2009 won him support among the island nation’s Sinhalese majority and he still has a very strong following. Sirisena is a former minister in Rajapaksa’s administration who defected last year to become president, promising fresh elections in 2015. The parliamentary election comes after months of deadlock in the legislature, as the six-month-old coalition government cobbled together by Sirisena and Prime Minister Ranil Wickramasinghe has struggled to pass key political reforms. Sirisena has faced opposition from members of his own Sri Lanka Freedom Party (SLFP), who remain loyal to Rajapaksa, while electoral reforms have been opposed by his main ruling coalition partner, the United National Party (UNP). Rajapaksa’s defeat cost him the leadership of the SLFP and the then ruling coalition, the United Peoples’ Freedom Alliance (UPFA), as some lawmakers switched loyalty to the new president. “Rajapaksa suddenly signed the nominations last night for Kurunagala district from UPFA at his residence,” his spokesman, Rohan Welivita, told Reuters. He becomes the country’s first defeated leader to seek a legislative seat. Kurunagala is Sri Lanka’s third largest electoral district, where most voters have relatives in the military. Aides of Sirisena, who had earlier said he would not give the nomination to Rajapaksa, said his hand was forced after most UPFA members asked Rajapaksa to contest against the UNP, which they see as following a pro-Western agenda. Sirisena, as leader of the UPFA, had to agree to the nomination to avert a party split, said one close aide. Civil society groups protested against the decision to nominate Rajapaksa, who faces charges of rights abuse over alleged war crimes during the final phase of the conflict. “President told the representatives he does not have total control of the nominations process of either the SLFP or the UPFA,” Keerthi Tennekoon, an official of election monitoring group CaFFE, said in an emailed statement. Rajapaksa’s rivals said he sought parliamentary privileges to protect himself from charges of corruption. But Rajapaksa has denied such claims.